General Manager Maggie Rosa is proud of her hotel. And for good reason. 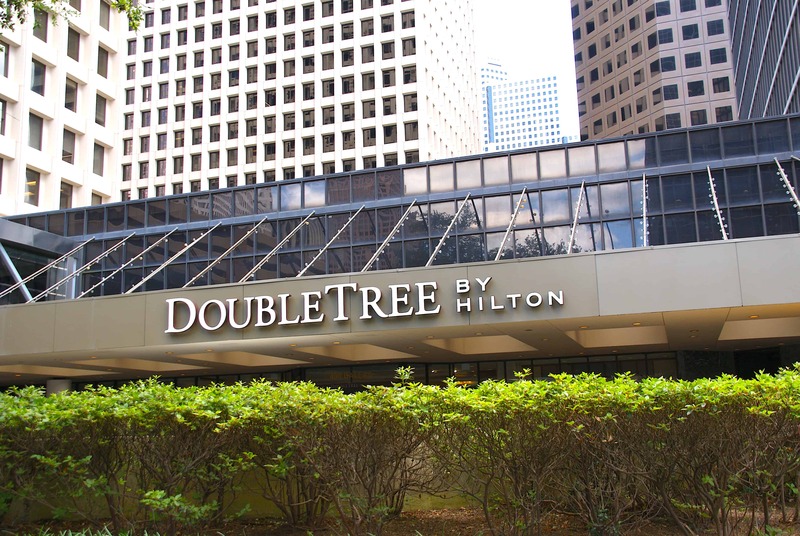 The Hilton DoubleTree Houston Downtown is a top choice to stay when visiting the Space City. Whether on a business trip, a sporting or theatrical event, or just visiting any of the numerous attractions in Houston, this is the place to be. With luxurious rooms, comfortable beds and impeccable service, The DoubleTree is the perfect place to rest your weary feet. 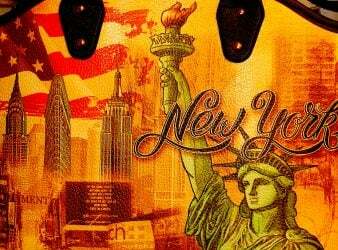 This Hilton hotel is very convenient to many downtown locations, and the hotel even has a shuttle to drive you to your downtown destinations if you don’t feel like walking. Starting with the welcoming smiles and the delicious warm chocolate chip cookies, the staff does a great job getting your visit off to the right start. 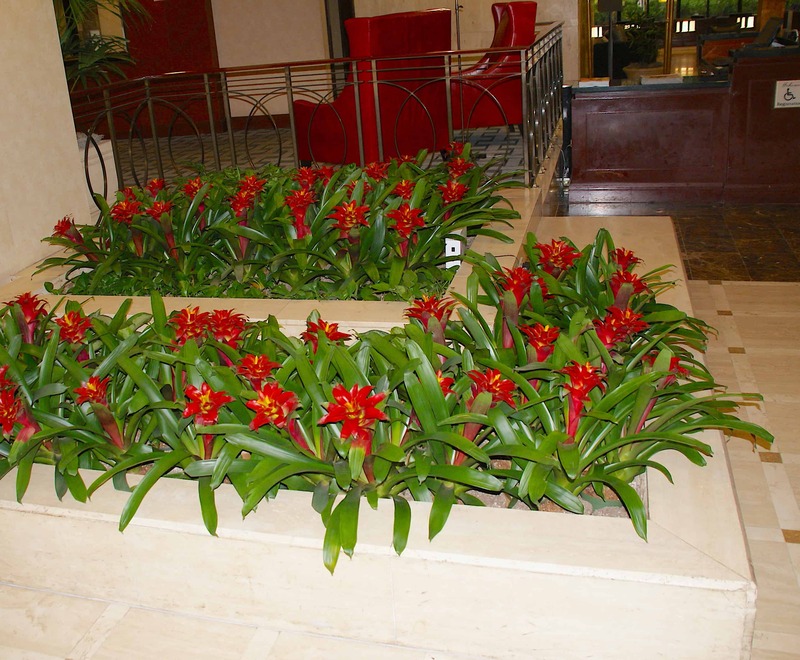 Our valet had taken care of our car, we were offered help with our luggage, and we walked into the lobby full of blooming day lilies to welcome us. Check in went smoothly, and we soon were headed up to our suite on the 18th floor. The spacious suite has floor to ceiling windows extending the length of the room, letting in plenty of natural sunlight and giving a great view of the Houston skyline. The beds were so inviting and comfortable, it was tempting to take a short afternoon nap. But the Wi-Fi and convenient desk, which made a great office away from home, reminded me I had work to do. This luxury hotel has 350 air-conditioned rooms to choose from. Each room features plasma televisions and all the current tools you need to get hooked up to the internet. Guests will also enjoy the hair dryers, complimentary toiletries, and free newspapers. Maggie graciously showed me around the hotel and the connections to nearby office buildings, parks, and the extensive underground tunnel. Diners could look out the large windows into the courtyard, where they were surrounded by the greenery of the lush landscaping outside. It’s always nice when you are in a downtown area to connect with mother nature, despite being surrounded by the skyscrapers and endless buildings of the city. 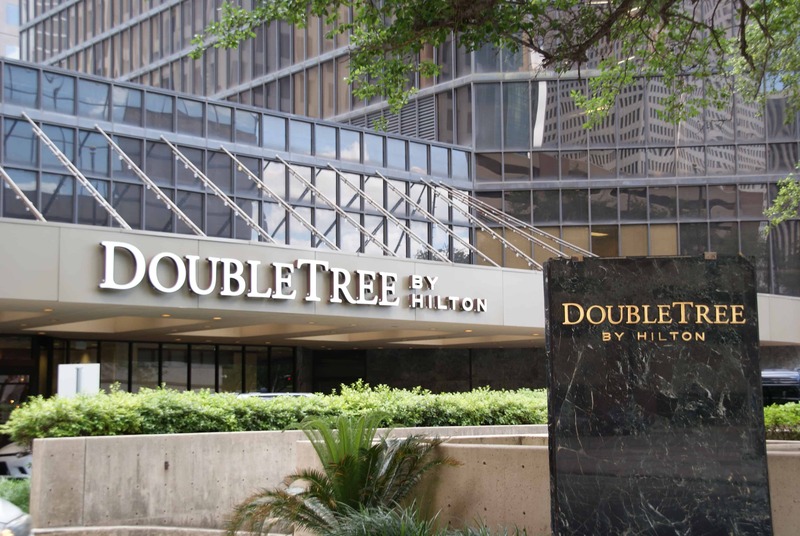 Located just off Interstate 45 in downtown Houston at 400 Dallas Street, the DoubleTree is in a great location in the heart of the city. The Library, the Underground Tunnel, the revolving Spindletop Restaurant, numerous parks, and the Theatre District are all just minutes away by foot. Those on business are happy to know that many major companies have their office buildings close by, like Chevron, Oracle, Shell, Exxon, Kinder Morgan, Price Waterhouse Coopers, and others. Attractions like the Houston Aquarium, Discovery Green, the George Brown Convention Center, Minute Maid Park, and Toyota Center are an easy 10 to 20 minute walk or a short drive from the hotel (remember the shuttle for downtown locations). The Museum District is only a ten minute drive, and is surrounded by established neighborhoods which can be accessed on streets lined with majestic oaks. For those wanting to use Houston’s Metro Rail, it’s only .4 miles away. The Houston Downtown Aquarium is a convenient 15 minute walk from the DoubleTree hotel. On the site of former Fire Station No. 1 and the Central Waterworks Building, the aquarium is located on Bagby and Texas Street, just off Interestate 45. Covering six acres, this entertainment complex is a 500,000 gallon aquatic paradise with over 200 species from across the world that call the water their home. Highlights include The Aquarium Restaurant, the Diving Bell Ferris Wheel, the Aquatic Carousel, and a variety of other exhibits and activities. And don’t miss the rare White Tigers playing in the ruins of the Maharaja’s Temple. 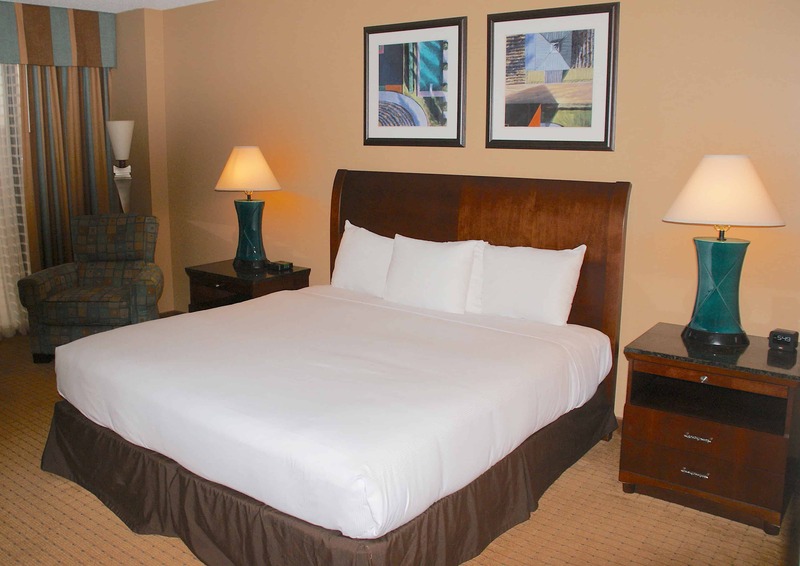 Guest rooms feature full length windows with scenic views of the Houston downtown skyline. There are several different layouts and sizes of rooms to meet your needs. Beds are extremely comfortable – I slept like a baby after visiting the Aquarium, Zoo, museums, parks, and other attractions earlier in the day. Bathrooms are spacious and well appointed, and efficient room service is available if you don’t want to leave the comfort of your room. For fitness buffs, the state-of-the-art fitness center is available for workouts. For business or other group meetings, the hotel has 1,800 square feet for conferences and meeting rooms. Plan your next meeting with the professional staff at the Hilton DoubleTree. They’ll work with you to tailor your event to meet your every need. Your members will appreciate the great location and convenience of staying in the hotel hosting their meeting or conference, with so many great attractions close by. Whether it’s a business meeting, class reunion, or family get together, the DoubleTree is the perfect choice for your group. Nearby parks include Sam Houston Park, Hermann Square Park, Sesquicentennial Park, Tranquility Park, and Market Square Park, just a short walk from the Hilton DoubleTree Houston Downtown. Discovery Green, a large park with lots to do for the kids near the George Brown Convention Center, is about a 15 minute walk. 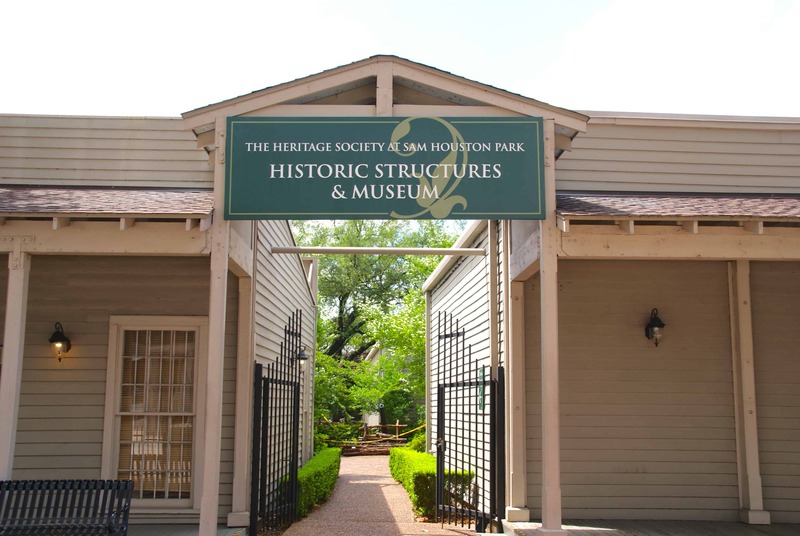 Also, don’t miss The Heritage Society Museum in Sam Houston Park, a short distance from the DoubleTree, for an interesting collection of historic buildings with intriguing stories in a park setting. Just steps from the towering skyscrapers of downtown lays Sam Houston Park. Ten historic buildings managed by the Heritage Society dot the 20 acre park, first established in 1899. The historic buildings include the restored Kellum-Noble House, an 1823 cabin, and a church built by German and Swiss immigrants in 1891. The buildings tell a story of diverse groups that settled in Houston, from freed slaves, successful merchants, and others looking to make Houston their home. Walk through the city’s history alongside blooming azaleas, the duck pond, and a variety of buildings. The contrast between these historical treasures and the modern skyscrapers of the urban landscape is mesmerizing. Cheer on the World Champion Houston Astros with MVP Jose Altuve at Minute Maid Park. Or root for James Harden and the Rockets as they fight for the NBA championship at Toyota Center. During football season, fans swarm to NRG Stadium to see JJ Watt and the Texans battle it out. Houston also hosts professional soccer, softball and rugby teams. In addition, college sports fans can follow Rice University, Texas Southern University, and Houston Baptist University. The Museum District in Houston features several world class museums and attractions. In fact, it is one of the top cultural districts in the country, with more than seven million annual visits. And over half of the museums are free. Some of the larger and better known museums include the Museum of Natural Science, the Museum of Fine Arts, the Children’s Museum of Houston, the Health Museum, and the very popular Houston Zoo. The Museum of Natural Science features top notch permanent and special exhibitions that fill the halls throughout the year. Special exhibitions have included the International Exhibit of Sherlock Holmes, Death by Natural Causes, and The Widlife Photographer of the Year competition. 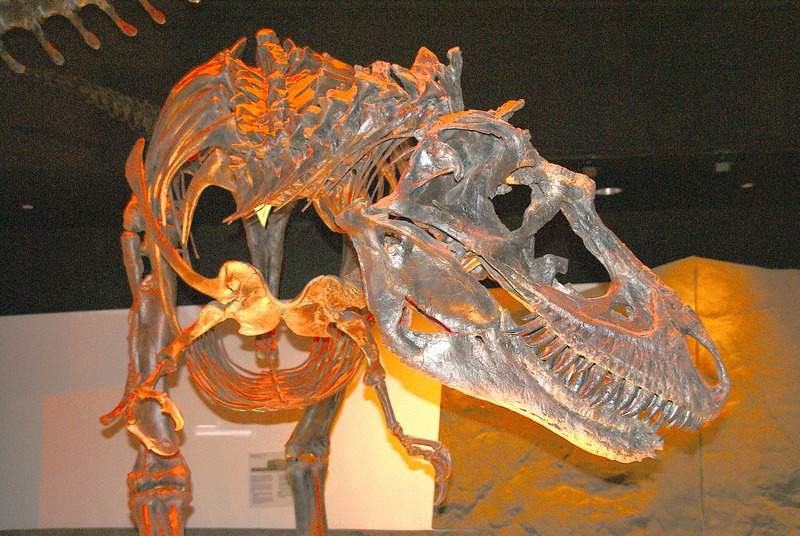 Children and adults will marvel at the $85 million “Prehistoric Safari,” one of the top six dinosaur exhibits in the United States. The Museum of Fine Arts houses more than 45,000 works, one of the largest and most prestigious collections in the country. 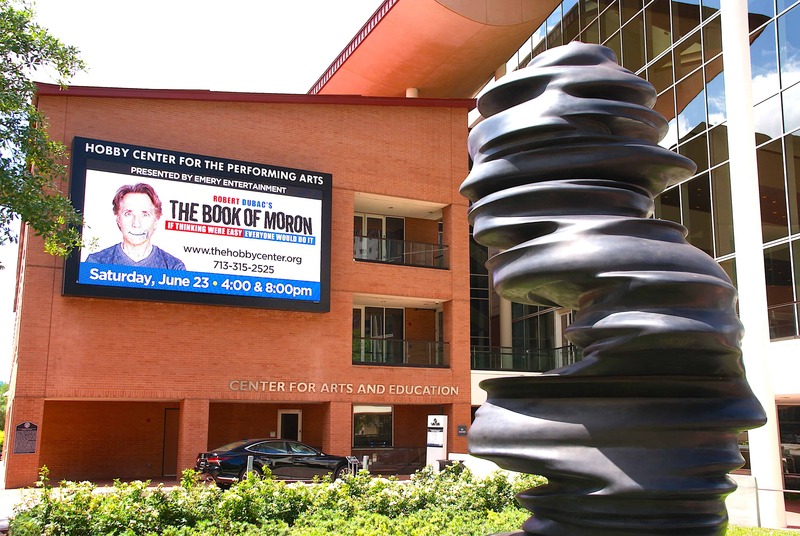 Other institutions featuring world class artwork includes the Contemporary Arts Museum, the Houston Center for Contemporary Craft, the Houston Center for Photography, the Rothko Chapel, Rice University Art Gallery, and the Menil Collection. The Menil Collection is one of the most important private collections in the country, and houses over 15,000 pieces of art. Other quality institutions include the Buffalo Soldiers National Museum, the Holocaust Museum, and the Museum of African American Culture. In addition, visitors can explore the Asia Society Texas Center, the Czech Cultural Center, DiverseWorks, Lawndale Art Center, and the Jung Center of Houston. Trofi Restaurant: Try a Southwest Cobb Salad, fajitas, a burger or breakfast at the convenient in-house restaurant at the DoubleTree. 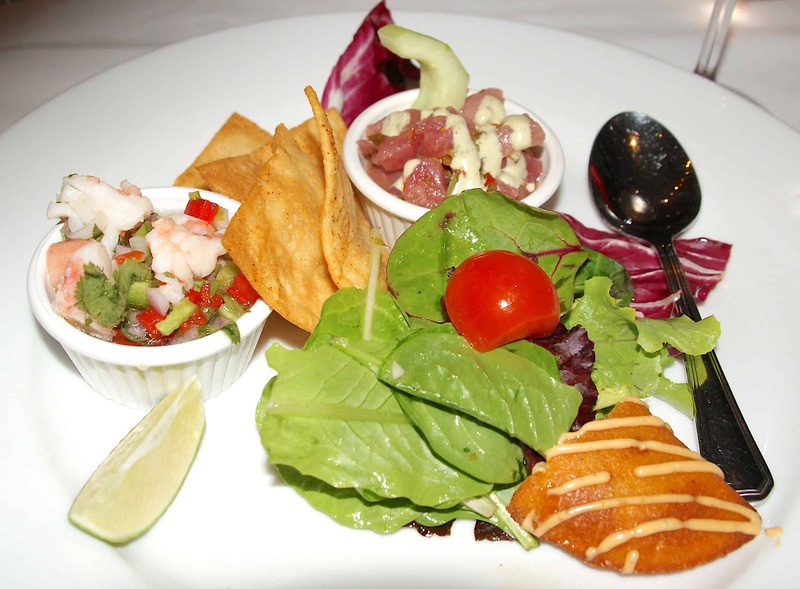 Spindletop Restaurant: This revolving restaurant atop the Hyatt Regency at 1200 Louisiana Street offers a 360 panoramic view of the Houston skyline, the Aquarium, and the surrounding area for miles. Arturo Boada’s Cuisine: This friendly neighborhood eatery in the Tanglewood/Galleria area at 6510 Del Monte is worth the short drive. The intimate dining room is the perfect place for a romantic dinner or business outing, with a great choice of Italian and Latin dishes and a wonderful wine list. 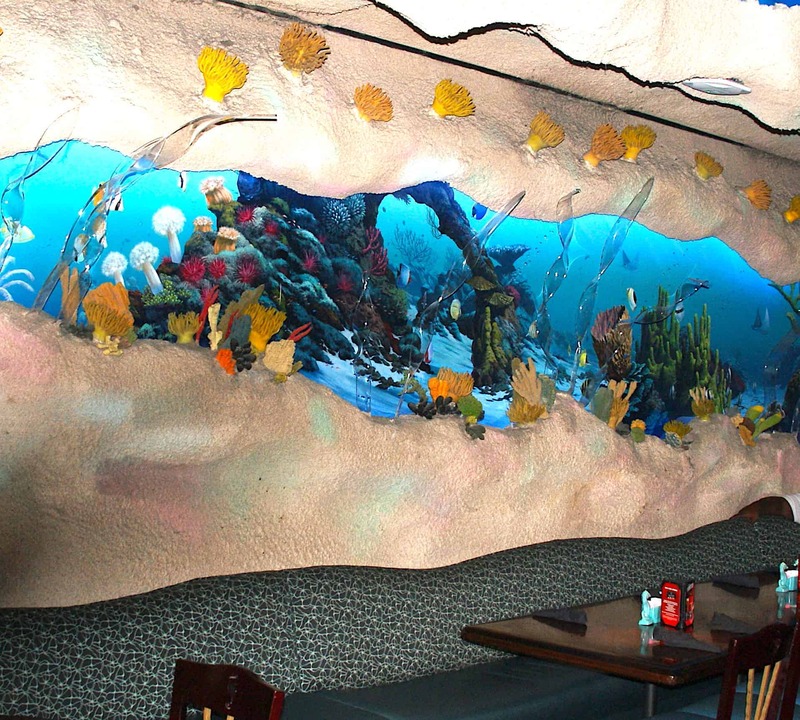 Aquarium Restaurant: Enjoy delicious seafood and other dishes while surrounded by colorful fish, sharks, and other sea creatures at 410 Bagby Street. Hard Rock Café: The iconic café at 502 Texas Avenue is convenient to the hotel and to the Hobby Center for the Performing Arts. Houston is a great city with so much to offer. Be right in the middle of the action for your business trip or vacation, right here in the heart of Houston. Make the Hilton DoubleTree Houston Downtown your home as you enjoy the theatre, great restaurants, museums, parks, or your favorite sports team. You’ll be glad you did. Thank you to the Hilton DoubleTree Houston Downtown for hosting our stay. Things to do in Houston with the Houston CityPASS.